Epernay (dpo) - Yesterday, tens of thousands of visitors attended a factory opening that appealed to the audience in quite a special way. The champagne manufacturer invited visitors and VIPs to the grand inauguration. 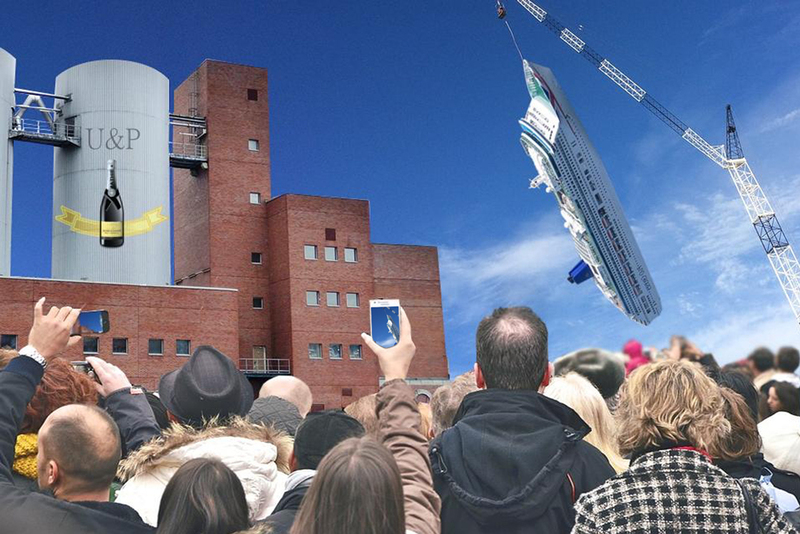 The highlight of the ceremony was the cruise ship, which is traditionally thrown against the walls of the factory. There were no concerns about spilling the ship’s heavy fuel oil. After all, the crashing and splattering are exactly what people look forward to when attending such ceremonies. Christening champagne and sparkling wine factories in this way is a longstanding tradition. In many parts of the world, it is also customary to crush a cruise liner on the factory hull as well as smashing one against the side. A further part of the custom states that the crane used to swing the ship into the side of the factory must be operated by a woman – a male crane operator would bring bad luck. The attendees at the inauguration in Epernay were equipped with champagne flutes and delighted in drinking the exquisite bubbly (Extra Brut) spilling out of a gaping crack in the wall of the factory once the ceremony was over.